Willow Chance is a twelve-year-old genius, obsessed with nature and diagnosing medical conditions, who finds it comforting to count by 7s. It has never been easy for her to connect with anyone other than her adoptive parents, but that hasn’t kept her from leading a quietly happy life... until now. I first started reading this book back in June when it was still in ARC form and I abandoned it. I just wasn't ready to read it then. But I had the opportunity to listen to the audiobook this week so I decided to take it since I've seen this book on some mock-Newbery lists and the announcement of the award is coming up in a few weeks. I fully admit I like to be in-the-know when it comes to books considered for awards, and feel a sense of pride when I've read the book that is announced as the winner. So I decided it was time to give this book another go. As far as the audiobook experience goes, I have to say what a difference an audiobook narrator can make. Robin Miles brought this book to life in a way the voices and expression I imagined in my head for each character could not. She got the mannerisms, cadences and subtleties of Willow just perfect, which is quite a feat given she was only using her voice to bring the character to life. 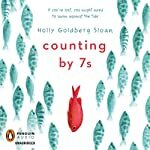 What is so endearing and beautiful about Counting by 7s is just what the publisher summary describes: despite the tragic hand Willow has been dealt, this is a book about coming back from the depths of despair and showing what a positive impact one person can make on a whole bunch of people's lives. Another perfect example of what Laurie Halse Anderson calls resilience fiction. The genre of Counting by 7s is realistic fiction but the way everyone is drawn to Willow despite her oddness gives the novel a slight feeling of magical realism. At first I questioned whether Counting by 7s was a middle grade novel that kids would actually read or if it was a book labeled as middle grade but would be more popular with adults than kids. I still wonder that somewhat, but I think presented as a class read aloud or given to just the right kid, this is a perfect book to share with students. I'd be more likely to recommend it to older middle school readers who are on the cusp of reading YA than to a 4th grade reader. But like always, it depends on the kid.